The studio is a perfect place to spend a rainy weekend. 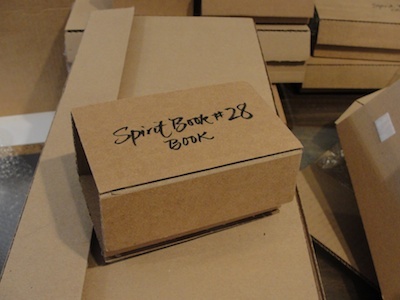 I started to put together a collection of the Spirit Books for an exhibition that could easily travel last year. I wrote a post about it on November 20, 2011 stating that I thought the packaging would be done by Thanksgiving and the supplementary material would be together by the new year. Well, we are now about half through that new year and I am just getting to finishing up the packaging part. I will no longer speculate on a time frame but will keep posting the progress.